We are very proud to introduce a new product for Christmas 2016 our Gardeners & Cooks soap. Customers were asking for a soap that was both citrus and exfoliant, and so here it is! 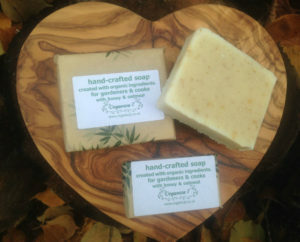 The soap is still very gentle on skin using our traditional and fully natural/organic soap base of organic olive oil, coconut, palm (sustainable) and sunflower oils. It is a hard cake of soap with a soft lather, which lasts and lasts and doesn’t turn into jelly (unless left sitting in water of course). It contains essential oils of lemon and lime, which are excellent for using in a kitchen environment, as well as the bathroom. They provide a refreshing, cleansing fragrance and are reputed to have disinfectant and antiseptic properties. 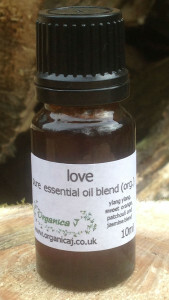 We are very pleased to introduce our new Love & Meditation organic essential oil blends. They are both available in 10ml sizes. 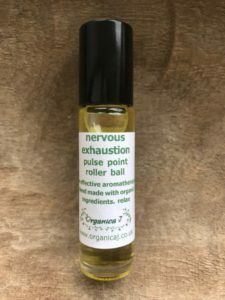 We have been using them in products and through at one outlet, but we can now offer these for sale online, as many customers have been asking for them to be made available to buy as organic essential oil blends. They are two very different blends, and here is some information to guide which one is best for your individual needs. Perhaps each one at different times in your life would be best, you will know best, but I hope the information below can guide you. s. Connect with a gentler emotion, help to open up your heart chakra and surround yourself with love. Spiritual, family, platonic, relationship and sexual love. You will know what is most needed in your life. Use a couple of drops of this blend in an oil burner or diffuser. On a tissue by your bed. Or diluted in a carrier oil of your choice for use on the body. 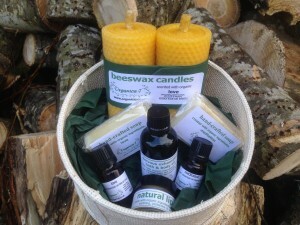 Contains organic oils of ylang ylang, sweet orange, patchouli and absolute of jasmine. New Meditation Essential Oil Blend. Encourages meditation by calming the soul, clearing the mental chatter from your mind. 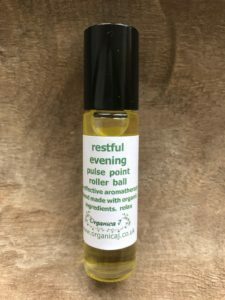 Connect spiritually with the help of this blend. A balanced connection with the higher resonance of frankincense along with the grounding effect of vetivert and sandalwood. An ultimate de-stress when life is busy. Allow the depth of this blend stroke away the days worries. Use a couple of drops of this blend in an oil burner/diffuser, on a tissue by your bed, or within your carrier oils of choice for use on the body. We have a special introductory 15% off both organic essential oil blends. Use the code 15BLENDS at checkout. This offer runs from Wednesday 24th February until Wednesday 2nd March 2016 and is only available on online orders. 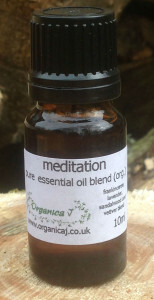 We hope that you enjoy using our new Love & Meditation organic essential oil blends. After listening to our customers, we now have a larger size of jar available. It is of course jammed full of our gorgeous yelllow/orange calendula ointment which is made from 100% organic ingredients. I use the calendula macerated in sunflower oil a lot in my aromatherapy practice often blended with other carrier oils and essential oils. The calendula macerate is the main ingredient in my ointment. It is really helpful for lots of skin issues – it calms an inflamed skin such as rashes & sunburn Cracked and damaged skin can respond well to treatment with calendula. 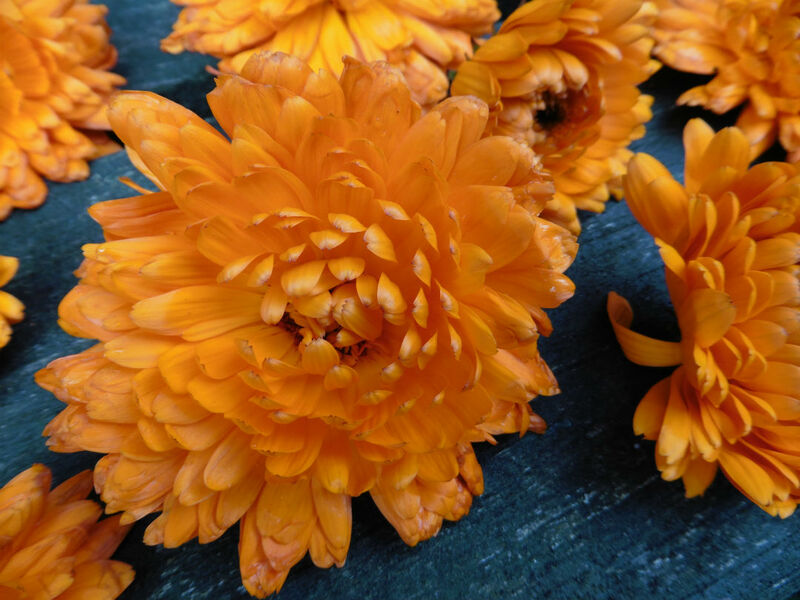 Eczema and psoriasis pro ne skin can be extremely difficult conditions to manage, but often I have had customers report good benefits with using calendula.